With the continuing warm weather many of us are spending quite a bit of time out of doors these days. While getting outside is always a good idea, we still need to take care of ourselves. Not only do we need to protect ourselves against the West Nile Virus, thanks to the mosquitoes, but we must also be careful about Lyme disease as well. Infected ticks can transit a harmful bacterium to humans, causing several symptoms. 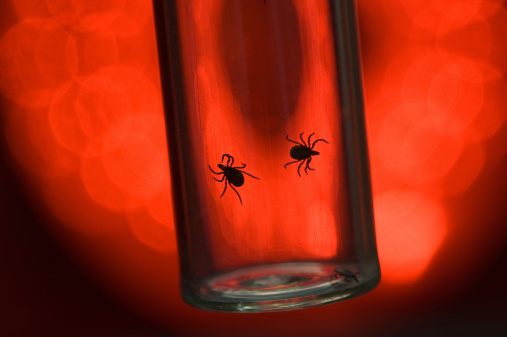 If left untreated, these symptoms might clear up on their own only to return later on as arthritis and joint pain, which is why you should see a doctor if you think you may have been bitten by a tick. The original bacterium is found in mice and squirrels and is carried from these animals to humans through blacklegged ticks. There have been no cases of Lyme disease being passed between humans, or between household pets to humans, but pets can carry the ticks into your home, so make sure that they are free of the pests before letting them inside. Prevention is key when it comes to ticks. Use an insect repellent if you are going to be outside in an area that is known to have ticks. When you are entering back into your home check yourself for ticks. They can attach themselves to your clothes and you can unknowingly carry them into your home as a result. Check your small children and pets for ticks as well. If you live in an area where ticks are prominent, you can incorporate a few landscaping techniques to your property in order to reduce your chances of developing a tick problem. There are pesticides that can be used to kill ticks, but the timing must be just right in order to yield the best possible results. Check with your local branch of the Environmental Protection Agency in order to determine the optimum time to spray your area. Because ticks like humid, wooded areas, you can deter them by cleaning up dead leaves, keeping your lawn short, stacking wood where it can stay dry, and by doing your recreational activities away from wooded areas. Deer also transmit ticks and no matter how beautiful these creatures are you do not want them near your property. Do not feed deer or leave any food lying around that might attract them. There are also bait boxes available from pest control companies that will actually cover the critters (such as mice and rats) that carry ticks with the same pesticide used to kill ticks. Symptoms of Lyme disease include a rash, which looks like a bull’s-eye (this is, in fact, the most common symptom with 70 to 80% of people developing this rash), headaches, fevers, and fatigue. Eventually, the disease can move into your joints and your nervous system if not treated. Thankfully, most cases are easily treatable with a round of antibiotics. If you are concerned that you might have come into contact with an infected tick, pay a visit to your primary care physician.